The Gabriel Method Review – Effective Weight Loss For Everybody? On 9/11 Jon Gabriel narrowly missed being on UAL flight 93. It proved to be the major wake up call that turn his life upside down. He decided to quit his job and finally figure out how to lose the mountain of extra fat he'd been carrying around for the previous 10 years. That's a lot of fat loss! After fruitlessly trying every weight loss method he could find and even working personally with Dr Adkins of the Adkins diet, be realized that he need to figure out his own weight loss plan. Drawing on his background in biochemistry research, he developed “The Gabriel Method”. This program finally enabled him to lose 220 pounds. and transform himself from obese yo-yo dieter into the fit, handsome man he is today. Traditional weight loss methods focus on what you can't eat. Gabriel found that this can lead to a lack of vital nutrients which cause the body to go into starvation mode and gain weight. The Gabriel Method focuses on making sure that you eat more. It's vitally important to eat all the nutrients which your body requires, otherwise you will still feel hungry no matter how many calories you eat, If you eat the right food, your body will allow the weight to melt away. John lost 220 pounds over a two and a half year period. The photos in the picture are of Jon himself. You'll notice that he has no saggy skin apparently due to the increase in nutrient intake. The Gabriel Method demonstrates how the emotions affect weight gain and is based around the knowledge of how to work with our bodies, not against them in order to lose weight. It clearly explains the mind/body connection and what this means in relation to weight loss. To assist weight loss the program includes guided meditation and visualizations to help stop you wanting to eat more food than you need. It also includes 12 videos which explain how to work with the Gabriel Method to retrain your body into into its new slimline self. Jon doesn't promise fast weight loss, in fact he says that unlike most diets where it's easy to lose a few pounds in the first week or two, initial weight loss will be gradual but after a while you start to lose weight at an increasing rate and this weight loss is long term, sustained slimness. A number of people on internet forums say they have spoken to Jon personally to get further advice and support. Slimmers who need long term sustainable results, not instant short term weight loss. People who have a large amount of weight they need to lose. 1 evening visualization (mp3 audio) to listen to before bed. Medical lecture (mp3 audio) – a recording of the lecture Jon gave to the American Holistic Medical Association. What do other people say about the Gabriel Method? I have a 5 month old, and I CAN do the Gabriel Method even with taking care of him. I did not feel that way about any other program. I have been doing the Gabriel Method, and the change is crazy. I feel so much better, more alert, i remember things I never would have and I have a ton more energy. I have lost 18lbs, and my goal is to go from 266 to 130. How do I Buy The Gabriel Method? 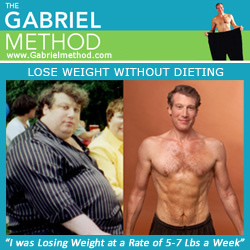 You can get the program from the official Gabriel Method website.